Don’t Want Long Distance on Your Landline? There’s a Fee for That! So… You’re connected. You’re hi-tech. You have an arsenal of digital communications devices in every room of your house and an extra one in your pocket. That trusty ol’ landline telephone is just habit to keep around; More of a comfy blanket than for communications use anymore. Maybe we could trim the fat and save a couple of bucks, eh? I mean, the only reason it’s there is to give you a number to use when filling out online forms so you don’t have to give your Skype ID or cell number. 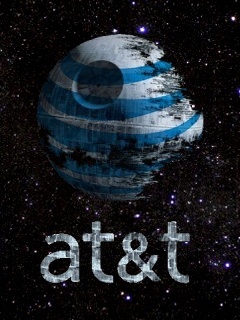 Well, AT&T is on to you! And they are going to make sure you pay more for less. It’s kinda their mantra, after all. AT&T has added a new $2-a-month "minimum use" fee to the phone bills of landline customers who don't have long-distance calling plans. Whether you don’t have long distance, or simply didn’t make two bucks worth of long distance calls, you now owe AT&T money. AT&T: Your source for insane fees, broadband throttling, and bandwidth caps. Good show, chaps!